Warfighters wielding the most powerful weapons in the world—their brains—are working in a seemingly unremarkable building on the grounds of Fort Detrick in Frederick, Md. They are the uniformed and civilian scientists and support staff of the U.S. Army Medical Research Institute of Infectious Diseases, and they protect and defend soldiers against all enemies biological. “The easy way to look at it is, we deal with things that kill you,” said Randal J. Schoepp, applied diagnostics branch chief at the institute, known as USAMRIID. That explains why the institute is playing only a minimal role in working to find a vaccine for the Zika virus. The institute is conducting a few small studies, but Zika “is not in our wheelhouse,” Schoepp said. Although Zika can make people sick, “it’s not going to make that many people sick,” he said. About 10 percent of those who are exposed to Zika actually become ill.
U.S. Army scientists trained these staff members with the Liberian Institute for Biomedical Research to test blood samples for Ebola. Ebola, however, is that bad of a virus. The two-year wave in West Africa that began in March 2014 was unprecedented in magnitude and scope, said Travis K. Warren, principal investigator in the molecular and translational sciences division of USAMRIID. During that period, more than 28,600 cases of the hemorrhagic fever virus were reported in Guinea, Liberia and Sierra Leone, according to the World Health Organization. Approximately 11,300 people died. USAMRIID played a key role in containing the health crisis, which had “significant humanitarian, economic, political and security dimensions,” said then-chairman of the Joint Chiefs of Staff Gen. Martin E. Dempsey. Research by the institute led to a diagnostic test, or assay, for Ebola infections while the Army scientists rigorously continued investigations into therapeutics to treat, and vaccines to prevent, the often-fatal disease. It’s not a question of whether there will be another Ebola epidemic, said Maj. Anthony P. Cardile, an infectious disease physician at USAMRIID, but when. “It’s just a matter of time,” he said. USAMRIID stood up in 1969 to protect warfighters from biological threats and investigate disease outbreaks and other public health crises. Its scientists have been at the forefront in making strides against deadly menaces such as anthrax, botulism, plague, ricin, and hemorrhagic fever viruses such as Ebola. “While they are low incidence, they have extremely high consequences,” said David A. Norwood, chief of the institute’s diagnostic systems division. Hemorrhagic fever viruses damage the organs and immune system and can lead to uncontrollable bleeding. Most of these viruses are zoonotic, which means they exist in animals and can infect humans. Rodents, ticks and mosquitoes are the main carriers of many hemorrhagic fever viruses, but the natural host of Ebola has not yet been confirmed, according to the CDC. Scientists believe that in Africa, people became infected first by handling wild animals hunted for food, or from contact with infected bats. The virus then was spread person-to-person through direct contact. It is fatal in more than 50 percent of all cases, though the statistic was as high as 90 percent at the beginning of the latest crisis. The Ebola Zaire strain, one of four known strains of the virus, was the culprit in the West Africa outbreak. When the crisis began unfolding, a small team from USAMRIID was already on the ground in Sierra Leone with prepositioned assays, working on a project on hemorrhagic fever virus identification and diagnostics. They immediately volunteered to start testing samples from sick people, Schoepp said, to determine whether it was Ebola or another virus that was making them ill.
After several months, as the disease spread throughout the region, a group from the CDC arrived in Sierra Leone to continue work there. 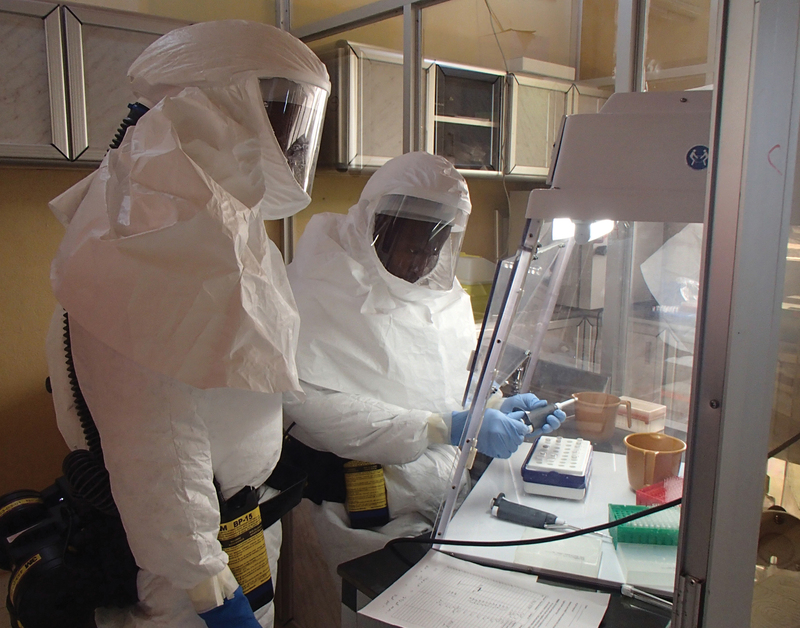 The Army team turned its focus to Liberia, establishing an Ebola virus diagnostic laboratory at the Liberian Institute for Biomedical Research (LIBR). Capt. Melissa Duggan helps Capt. 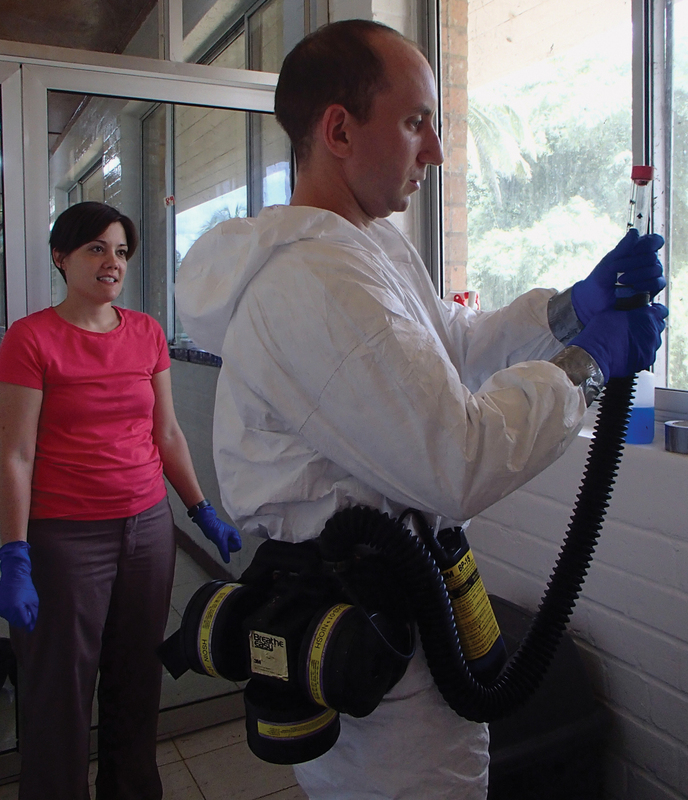 Mark Bailey prepare to enter the biocontainment laboratory in Liberia to begin Ebola testing. 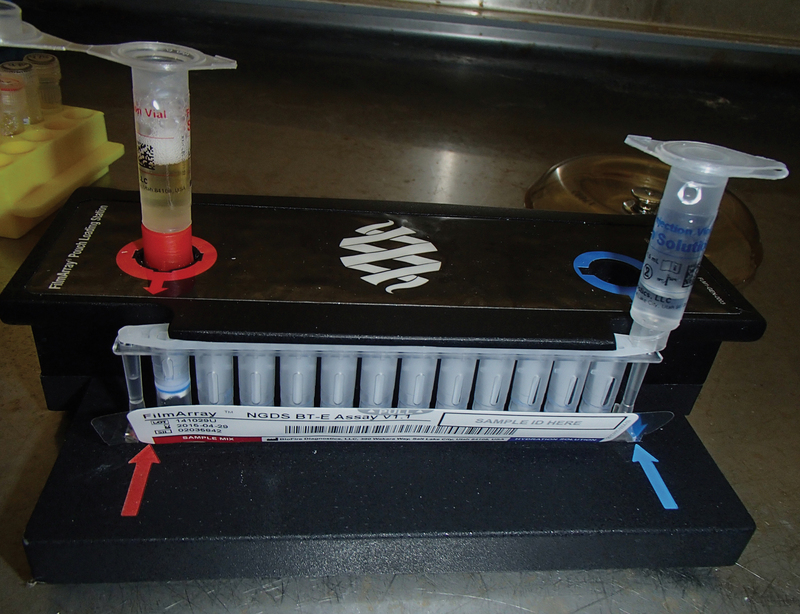 This diagnostics system was used for the Army-developed assay for Ebola testing. Despite less-than-state-of-the-art equipment and safety precautions—the researchers wore multiple pairs of disposable gloves that they taped to protective suits instead of the highly specialized, encapsulating “space suits” with built-in gloves that are usually worn in the lab when dealing with dangerous toxins—“we never had a single fever watch, not a single potential exposure,” Schoepp said, adding that the work was grueling, but also gratifying. Back in the U.S., Army researchers worked with the Food and Drug Administration to quickly get an emergency use authorization for the assay that was being used in Liberia. With approval granted in record time of just under a month, “It was the first assay that was developed for human testing in the United States on U.S. citizens,” Norwood said. That assay was used in state public health laboratories throughout the U.S. as well as in DoD labs all over the world. Researchers also proved the assay would work in diagnosing Ebola in canines as the Army considered deploying military working dogs with their units when it began making plans for Operation United Assistance, deploying about 2,800 troops to Liberia to set up mobile testing labs and provide engineering and infrastructure support, among other duties. “There was concern over what to do with this dog who had been in close proximity and potentially exposed to Ebola,” Norwood said. CDC and Texas public health officials agreed to send to USAMRIID blood samples from the nurse’s dog, Bentley, while he was quarantined for 21 days. Testing confirmed Bentley had not been exposed. In contrast, around the same time a nursing assistant in Spain contracted Ebola from a missionary who had been in West Africa. The nurse survived, but her untested dog was euthanized as a precaution. When the emergency in West Africa began, no therapeutics existed that fit the necessary criteria for use, including a ready supply and data regarding efficacy and safety. Cardile, who deployed to Liberia with the 1st Area Medical Laboratory to support the U.S. response, said there were “fantastic efforts” by outside groups working with the Army researchers to bring therapeutics to clinical trial. But by the time they were able to get the approvals to do so, the outbreak was winding down. “It’s a mammoth process to go through,” Cardile said. “Everything would be essentially preprogrammed so when there’s an outbreak, we could just hit ‘play,’” Cardile said. Scientists at the Walter Reed Army Institute of Research are working on developing a vaccine against the Zika virus. One candidate has progressed to the stage of clinical study in nonhuman primates, according to the Army, and officials are hopeful that human trials can begin this year. “We started to conceptualize the development of the Zika vaccine actually a couple of years ago,” said Col. Stephen Thomas, an infectious disease physician who is leading a team of about two dozen researchers at the institute, located in Silver Spring, Md. But with the spread of the virus accelerating in some parts of the world, that effort has taken on new intensity, and “we very, very quickly started to conceive animal studies,” Thomas said. The Army initiative is part of a broader DoD effort under which several military labs are getting $1.76 million in extra funding to expand Zika virus surveillance worldwide and assess the potential impact of the virus on the health and readiness of deployed U.S. service members, officials said. Zika is spread through the bite of the Aedes aegypti mosquito. The common symptoms—fever, rash, joint pain and red eyes—are usually mild and last several days or a week, according to the Centers for Disease Control and Prevention (CDC). But the unborn babies of pregnant women who become infected can develop microcephaly as well as other severe fetal brain defects, the CDC says. As of early April, 4,905 confirmed cases and almost 195,000 suspected cases had been reported in 33 countries in the Western Hemisphere, according to the Armed Forces Health Surveillance Branch. Thomas said the virus is “emerging” as a DoD health issue: Four soldiers and about a dozen other members of the U.S. military community were recently infected by Zika after traveling to Central or South America. Since the virus is most prevalent in that part of the world, troops deployed to areas in U.S. Southern Command are most at risk, he said. 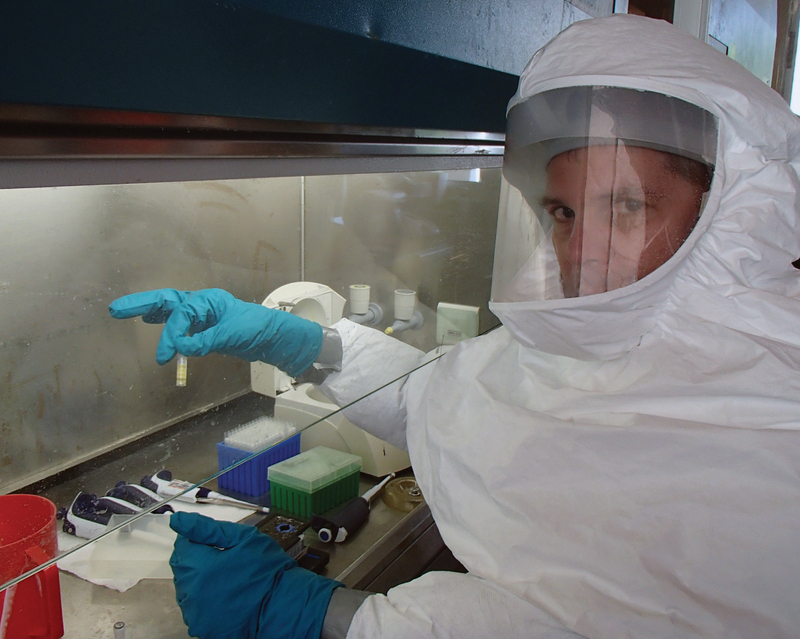 Lt. Col. Kurt Schaecher works with blood samples submitted for Ebola testing in Liberia. The FDA considers data from animal studies when it’s too dangerous or otherwise not possible to conduct initial testing in humans—and this is the stage that can become uncomfortable. The institute’s animal research laboratory has been certified by the American Association for Accreditation of Laboratory Animal Care. Most of the veterinarians are active-duty Army, Dye said. In addition, many of the veterinary technicians are retired or former Army whose skills are highly prized. The Army scientists’ work with toxic viruses takes place inside containment labs with the highest safety and security measures possible. There are strict protocols regarding entrances, exits and emergencies, said David Harbourt, the institute’s biosafety officer. All employees must complete a three-day, intensive course on protocol before they’re cleared for escorted access. “It took me 11 months to get unrestricted access” to the biosafety level 4 labs, Harbourt said. Additionally, “people go through extensive screening and background checks to make sure they’re qualified,” he said. They also undergo a thorough medical evaluation “to make sure that they’re fit for duty” to work inside the laboratory environment, he said. A new building for USAMRIID is under construction at Fort Detrick. The workforce will begin moving into the $650 million facility in 2017. Meantime, the Army’s cutting-edge research continues.